I took a little time today to shoot something new. 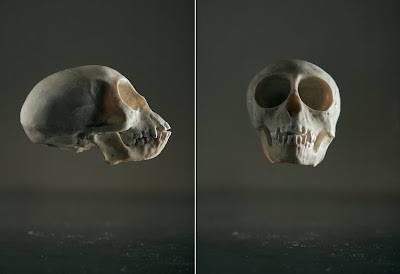 This cast of a monkey skull I got from Blake Britton, an artist I photographed in Portland. I wanted to continue with the series I've been pursuing called Dichotomy however I don't think there is anything I can add to this series without becoming redundant. Onto something new it shall be. This is the last image I'll be posting for a while. I have to take sometime away from shooting to focus on marketing new business, print a new book and update my website. See you somewhere.